A bit of history: The story of the Charles 803: a fourth-generation true reflux alcohol still. This still is a highly evolved, three-in-one design with automatic temperature control. This allows you to make 180 proof alcohol, first time, every time! This still design is the result of a series of workshops, which took place in Sacramento, California in 1979 and 1980, during the infamous Arab Oil Embargo. Gasoline had risen in price from $0.65 /gallon to $1.20/gallon in the space of about eight months! A small group of alcohol fuel enthusiasts met weekly over a period of several months, and eventually we decided to incorporate as a non-profit educational group, which we called the Calif. Alcohol Fuel Producers Association (CAPFA). 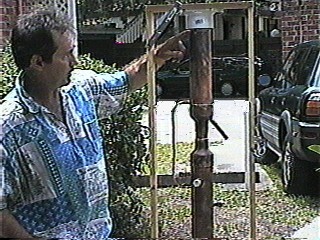 I had built my first still a few months earlier, and had demonstrated it publicly at the Earth Day Festival on the Univ. of Calif., Davis campus. That still was powered entirely by the sun and a tiny stream of pressurized city water, which created a vacuum so that I could boil water at 129 degrees F (54 C). The physics principal is that lowering the atmospheric pressure will lower the boiling point of water. I built the still out of 2PVC pipe and a five gallon water bottle. I was working as a water treatment technician at the time, so had become an expert on vacuum injection systems, as this was how chlorine gas is injected into the city water supply. I always hated working around chlorine, but I had become adept at rebuilding the Wallace & Tiernan chlorine injectors. They have to work perfectly in order that the amount of chlorine gas is precisely (and safely) controlled. I had scavenged an injector that was beyond factory tolerances for reliable use, but was perfectly adequate for my intended use. I only produced slightly less than a pint of alcohol per day, but I was pretty happy, since it had cost absolutely nothing to make it from five gallons of 5% beer (which I had made from a sack of worm-infested brown rice. It only contained perhaps quart of pure alcohol (.05 x 5gal=0.25gal). The main problem was that I didn't have a way to control the temperature, so my final product was only 120 proof (60% alcohol). The second problem I had was losing just about half of the precious alcohol vapors which got sucked (injected) into the waste water stream through the venturi nozzle. However, as a result of my willingness to experiment with a new (to me) technology out in public, a number of people signed up on my list to get involved with promoting alcohol as an alternative to gasoline. Although my vacuum still was nothing like the Charles 803, it nevertheless provided a focal point for bringing together a group of people who all wanted to learn how we could make our own fuel. It was at UC Davis that I first met Mike Mandeville, who had earlier that year published a small book on how to make a solar still (his design was also fairly simple but effective, and only yielded small amounts of ethanol). So, from this phone list, we gathered a few people who became actively involved in our small group. Making the still was only the first step, as beyond this, we wanted to establish an entirely new industry which provided alcohol at the gas pumps instead of gasoline. There were a dozen people in our group which started meeting every Wednesday night for a few months, and every week we would gain one or two people, one of whom was Pete Charles. Pete was an electrical inspector for the City of Sacramento, and at this point he had already been experimenting in his backyard, fermenting some beer mash and trying to distill it. There have been lots of stills built over the years, and the dynamics of ethanol distillation are well known and widely employed. However, within the beverage industry, a much lower proof alcohol is the end product. The other extreme is within commercial ethanol production for the chemical industry, where the stills are very high tech and much larger, and fairly expensive to replicate. Pete Charles was working with a typical old style design where the distillation column is attached to the top of the cooker, so the steam can readily rise up inside the distillation column. The problem, he noted, was that once the mash starts to boil, it takes a lot of fiddling, trying to adjust the flame higher or lower, to get just the right amount of steam volume rising up into the reflux column. There is always a time lag between your adjustments and the desired effects. Plus, you have to apply just the right amount of cooling action to that steam, so that the alcohol proof could be regulated. His first innovation was to cool the steam directly, by putting the cooling coils on the inside of the column, rather than having the alcohol go through the inside of a coil with water on the outside. This made a big improvement, but there were still problems. For one thing, attaching the distillation column to the top of the cooker barrel made the whole thing sit up pretty high, almost beyond reach, plus the heat from the boiler made it difficult to get close to the distillation column, where he needed to adjust the temperature. So on his next run, he removed the column from the cooker, capped off the bottom and soldered a threaded pipe fitting near the bottom, where he then attached a radiator hose, with the other end going up to a fitting at the top of the 50 gallon drum he used as a cooker barrel. This hose piped the steam from the top of the cooker into the bottom of the still. He needed to support the distillation column, so he attached it to the corner post of his carport with a couple metal straps, and fired up his next batch of mash. This was an instant success, and he was able to get a much higher proof than before, about 140 to 150 proof. He used this first batch to run his lawnmower. He had explained all of this to our group, and so a couple of us went out to his house to see what he was doing. Encouraged by his progress, we scrapped the idea of my earlier vacuum still, and we decided to make one like Pete Charles had made. One of our members, Hollis Osborne, a High School shop teacher, volunteered the use of the High school welding shop for the next Wednesday night meeting. I spent a day going to scrap metal salvage yards, buying various size pieces of brass and copper pipe, and brought all of this stuff to the first meeting at the welding shop. We had 12 people, all with different backgrounds, and we pooled our efforts in building that first still. We completed it in a couple of evening sessions. The next weekend, we met at someones house, and tried to run a small batch. We only got 100 proof on our first run, and we lost an awful lot of alcohol vapor as uncontrolled steam, but we weren't at all disappointed. It did work: it just wasn't very well regulated, in terms of temperature. Les Wescamp, a retired industrial engineer, said he could fix that problem. He came up with an automatic temperature control valve used in the refrigeration industry, and at our next shop session, we added two special fittings: one for the temperature probe, and another to hold a temperature gauge. Now, we really had something! The temperature gauge was this beautiful old brass mercury-type gauge from a railroad engine, which complimented the brass pipe we had made the still out of. That weekend, we had another still cook-off experiment, and our hydrometer showed 190-proof on the first run. We were ecstatic! Mike Mandeville pointed out that since the stuff was still hot, the hydrometer reading would have to be compensated for temperature. We didn't have a compensation chart, so we waited and let it cool down. It turned out to be 165 proof! Not too shabby, we thought. In the meantime, Les and Jody were busy working on converting Les Wescamp's 1955 Chevy pickup truck to run on alcohol. The first thing they did was to rebuild the carburetor. They substituted a larger main jet , and changed the paper and cork gasket materials to a kind of rubber material. (More about this later). Plus, they extended the fuel line by attaching it to a piece of copper tubing which made two wraps around the exhaust manifold, so it would get pre-heated a bit We drained the gas tank, put in a new fuel filter, and poured in our first batch: a little less than two gallons. The truck started up almost right away! We had done it! The total cost of converting the truck (since we didn't count our time) was just under $15.00! Well, we reported our success to the rest of the Wednesday night group, and since we still had additional pipe from my previous day of scavenging parts, we broke up into three groups of four, and we built three more stills in the next two weeks. The ones made out of brass pipe had to be brazed, which was a slow and expensive process, while the ones we made from copper were easily soldered. During this process, we came up with a couple more design improvements, and we experimented a bit with variations on the basic design. The number of people in the class kept growing, while others dropped out, but there was a whole bunch of people, all wanting their own still. We even had a couple old farmers driving from one hundred miles away to come to the Wednesday night shop class. I was still working at this time for the city water district, so I had access to wholesale prices at one of the local pipe supply houses. I bought some twenty foot lengths of 3 inch copper pipe and all the fittings we needed, and I found an industrial source for the automatic valves we needed. So we gathered materials to make 12 new stills, as we now had around twenty people in the group. This time, however, we didn't just dive in and make the same still as the first one. We now had a total of five stills, including the first one that Pete had made. We compared them, as each was a little bit different. We critiqued them as to how they seemed to work. Many of us had started fermenting our own private batches of mash at this point, and we wanted to see what worked best. Les Wescamp, with his background in food process engineering, studied the literature on commercial distillation technologies pretty thoroughly. He then calculated the optimal size and length as a function of column diameter, as well as adding the concept of the bubbler (or doubler, as it is also called in the distillation industry, as it doubles the alcohol steam volume by quickly removing half of the water vapor. More on this, later). So, armed with the calculations Les had done, we arrived at our final design, which was actually the fourth generation still, having gone through three earlier models. Pete Charles documented this by drawing up professional blueprints, which we submitted the Bureau of Alcohol, Tobacco, and Firearms, in order to get an experimental fuel distillers permit. The BATF had a section in the permit application which asked for the design model / manufacturer of the still, so he labeled it the Charles 803 and labeled the blueprint as such. The year was 1980 and this was his third design, hence the number, 803. You can make this still in one or two weekends, if you have some basic hand tools and a propane soldering torch. The year was 1980. Our group, California Fuel Producer's Association (CAPFA), continued with our research into ethanol, and we collected a couple of file cabinets full of various out-of print articles about using fuel alcohol, as it was used quite widely during World War Two. Ethanol was produced for the Air Force, and used as aviation fuel, as well as used by farmers in the US who resorted to making their own fuel because of the gas rationing during the war. We even discovered a 1939 book called, "Food For Thought" which detailed the economics and wisdom of making fuel alcohol and producing a very valuable by-product of distillers dried grain out of the solids removed from the mash after distillation. (This is now partially e-published-- see the link below). A local realtor had an empty office next door to his office, so he donated a one-year lease on the office, to CAPFA, and we put in a phone line and opened up for business. At first, we thought we would simply operate as an educational and informational non-profit, group, but it turned out that what most people wanted to know, was how to make their own fuel alcohol. We started publishing a newsletter, and charged $35.00 for membership. Within one year, we had over 900 members. During this time, we participated in various public and televised events where we demonstrated running our legal still (getting the BATF "experimental fuel" permit was no problem), and pouring the fuel into Les Wescamp's pickup truck, or into an army surplus generator or even a motorcycle. The last two didn't even require any real engine conversion, other than adjusting the needle valves a little. We took our "dog and pony show", as we fondly called it, on the road, setting up booths at various county fairs, and we often attracted media attention. Whenever we were at an agricultural fair or a county fair, people could smell the still cooking from a long way off, and come around to see what we were doing. Sometimes we really didn't have time to process and ferment a batch of mash, as we tended to run the still pretty often. So I would start calling around to see what donations we could get, such as over-ripe fruits from farmers (one time we got a couple of bins of rotting and wormy peaches, but the sugar content was pretty high, so once fermented, it smelled wonderfully of peach wine. The resulting 170 proof distillate had the unmistakable aroma of peach brandy.) Another time, I got a winery to donate a 60 gallon wooden cask of "class 4" wine --meaning that it was unfit for drinking-- but this would normally be used within the winery to be distilled and then this high proof alcohol is used to spike the alcohol content of the cheap wines like Ripple, which are sold with a screw cap rather than a cork. I distilled this batch of wine at an agricultural equipment show at the fairgrounds in Stockton, California, and what a fragrant brew that was! It was a really cold February day, so people liked standing around my horizontal 50-gallon barrel I was using as a cooker, warming their hands over it. They all had stories about their dad or grandpa, and how they had run a still back during prohibition. I supported the cooker barrel with some old firebricks, and had scavenged an old Square D electrical panel box, which I used as a sliding firebox drawer under the still. I could hook the front edge of the long metal box with my hand axe, slide it out from under the barrel, throw in a new log or wood scraps I had found in the dumpster, and push it back under so as the keep the heat going until the wine started to boil. Then you would hear the marbles inside the still start to rattle as the steam started to push up through the still, and it would be time to check the cooling water valve settings, making sure you had a big enough container to catch the clear-as-water high-proof coming out of the top spigot. We printed up literature about the still itself, and started marketing classes where students would get hands-on experience building a still, plus they would take it home with them. We charged $500 for a 2 day, 2 evening class, which included the cost of the materials and a book by Mathewson, The Alcohol Fuel Manuel. Our first commercial venture in teaching this class was held in Fresno, Calif. and we had three instructors: myself, Rich Villa, and Les Wescamp. Plus, our friend Jody, who had a racing business, building carburetors for fuel dragsters, taught the automotive section of the class. We had 19 students, and they took 19 completed stills home with them on Sunday night. By this time, I was one of the Directors of CAPFA, as we were now incorporated, and did most of the work of buying the materials, setting up and running the classes, and finally, running one of the stills on Sunday afternoon so everyone could see the dynamic process of ethanol production in action. Over a 2-year period, 290 CAPFA-built stills were made in these workshops under my direction. Many of these were used productively for fuel, although I do know that a small number of them were made expressly for making bootleg white lightning (they silver-soldered them instead of using lead solder). Quite a few of us converted cars, trucks, and tractors to ethanol. I have owned four different vehicles which I have run on alcohol, including two old Volvos, a Ford truck and an old Datsun, which I drove for over almost two years. They all had manual chokes, so I never converted them really: I would just pull out the choke a bit when I decided to run a batch of ethanol through the engine. The alcohol fuel would clean out the carbon in the engine, and when I switched back to gasoline, it ran just like new again. This was all before the days of fuel injection. For instructions on how to convert an engine to run on ethanol, go to my web page, "Going on the Road". Later, I would switch back to running on gas, so I usually had to change out the fuel filter afterwards-- the ethanol would always pick up some rust from the fuel tank. On other vehicles we had done the total ethanol conversion process to, including increasing the compression ratio, 160 proof seemed to work just fine, and this gave us about the same mileage as gasoline! By running my cars with the choke pulled out, I ran a pretty rich mix, so my mileage was only perhaps 80% of what the car would do on gas. Also, I tried to stick with running only 180 proof, since I didn't have any fuel pre-heater or anything. Well, this was all about twenty years ago, and looking back, public interest in alternative fuels seemed to fall apart as soon as the gas prices started coming down again. For a period, gas rose as high as $1.45/gal, and after awhile, when it dropped back to $1.15, people seemed to just accept this as the normal price, forgetting that just a couple years before, they were only paying $0.65/gallon. Our group, CAPFA, never really made any money this whole time, as running the classes and running the office always seemed to be a break-even proposition. After the Oil Embargo was over, and people got used to paying these higher prices for gas, fewer people were interested in signing up for the classes. It slowed down so much that we could no longer keep the organization afloat. We formerly dissolved, and Pete Charles dropped by the office one day to give me the original blueprint of the still plans. He told me, "People are calling me in the middle of the night to buy these plans, then they bother me with a lot of stupid questions. I'm going to turn them over to you, and I hope you will put them to good use. I just can't handle all the calls I get about this anymore." I had at that point in 1981, put in two years of mostly unpaid hard work promoting alcohol fuel, and now everyone was jumping ship. When we cleaned out the CAPFA office, I held on to all the documents that needed to be saved, and kept them over the next twenty years. Now, most of this information is here on this web site. I recently built another still, which is the one in the photo directly below. This one has a couple of improvements not on earlier stills, but these are fully described in the updated written instructions that I send out with the blueprints. I also include other photos with clear details of how evrything goes together. 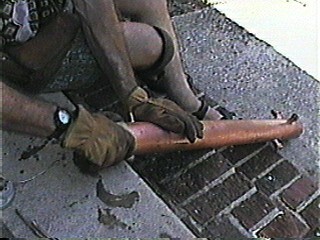 This still, then, is a fine tool, which has evolved through many designs. It is rated (theoretically) at 7.5 gallons per hour of 180 proof alcohol. I have never seen it produce more than five gallons an hour, though, but then, maybe I just didn't have a big enough boiler. To buy a copy of the still blueprints: go to "Contact Us" for details. I will mail you a hard copy of the blueprint for $30.00, and send you an email (800 Kb)with 40 pages of instructions and photos, in an Adobe .pdf file. You also get an Adobe drawing of the still right away with the instructions, and the hardcopy of the blueprints will get to you within one week, by post. The distillation column is separate from the boiler for better control. After you buy the blueprints and start building the still, if you can't find the automatic temperature control valve that I describe, then you can buy it here by clicking on this shopping cart button, below. Note from Nanda Warren: This option is currently unavailable, until I locate and contact the supplier that my father used. I hope to make the temperature control valve available in the future. Do you have a website that no one sees? You can submit your url to Search Engines for free. Check this out!